The genus Roseomonas comprises a group of pink-pigmented, slow-growing, aerobic, non-fermentative Gram-negative bacteria, which have been isolated from environmental sources such as water and soil, but are also associated with human infections. In the study presented here, Roseomonas mucosa was identified for the first time as part of the endodontic microbiota of an infected root canal and characterised in respect to growth, antibiotic susceptibility and biofilm formation. The isolated R. mucosa strain showed strong slime formation and was resistant to most β-lactam antibiotics, while it was susceptible to aminoglycosides, carbapenemes, fluorochinolones, polymyxines, sulfonamides and tetracyclines. Biofilm formation on artificial surfaces (glass, polystyrene, gutta-percha) and on teeth was tested using colorimetric and fluorescence microscopic assays. While solid biofilms were formed on glass surfaces, on the hydrophobic surface of gutta-percha points, no confluent but localised, spotty biofilms were observed. Furthermore, R. mucosa was able form biofilms on dentin. The data obtained indicate that R. mucosa can support establishment of endodontic biofilms and furthermore, infected root canals might serve as an entrance pathway for blood stream infections by this emerging pathogen. Biofilms are groups of sessile microorganisms living within a self-produced matrix of extracellular polymeric substances. These microbial communities are ubiquitously found on abiotic and biotic surfaces including human implants and tissues. In bacterial infections, biofilm formation can significantly increase pathogenicity of bacteria and protection of microorganisms from disinfectants and antibiotics (for a recent overview, see ). Mixed biofilm communities are also involved in dental infections, e.g. infections of the root canal . The often complex anatomies of root canals with e.g. isthmuses and lateral canals [3, 4] can cause failure of endodontic therapy due to the persistence of microorganisms in the root canal system and dentin tubules due to insufficient removal of biofilm and disinfection . Beside some prominent species, such as Enterococcus faecalis (see e.g. ), which are observed routinely, different Gram-negative and Gram-positive bacteria as well as yeasts have already been described as part of the microbiota of infected root canals (see e.g. [7–9]). Many of these microorganisms are only poorly characterised, although they might significantly contribute to persistence of the microbiota. Special properties which might be important in this respect are e.g. the production of antibiotic resistance determinants or extracellular polymer matrices crucial for biofilm formation . In this communication, we describe the characterization of a Roseomonas mucosa strain isolated during treatment of an infected root canal. 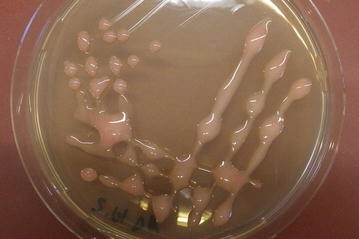 The genus Roseomonas comprises a group of pink-pigmented, slow-growing, aerobic, non-fermentative Gram-negative bacteria, which have been isolated from environmental sources such as water and soil, but are also associated with human infections [11–15]. Twenty different species with validly published names were described [16, 17]. Infections of humans with Roseomonas species are rare and mainly observed in immunocompromised patients, most likely due to a low pathogenic potential of the bacteria. Catheter-related bloodstream, urinary and respiratory tract infections with different species of the genus were reported [18, 19]. R. mucosa seems to be the most prevalent species in clinical samples [18, 20, 21] and skin microbiota seems to be the main reservoir of this species . In contrast to other species, in case of infections with R. mucosa, a considerable number of immunocompetent patients have been reported [20, 23] indicating a higher pathogenicity and making the bacterium an emerging pathogen . Samples were collected during regular root canal treatment following informed patient consent and ethics commission approval. Following local anesthesia and isolation of the tooth with rubber dam (Roeko Flexi Dam non latex, Coltene/Whaledent, Langenau, Germany), access cavities to the pulp chambers of the teeth were created using high speed diamond rotary instruments under ambient irrigation. The root canals were subsequently instrumented using sterile C-Pilot files (ISO size 08, 10, 15, VDW, Munich, Germany) which were directly placed in sterile 2 ml test tubes. 2 ml of sterile phosphate-buffered saline was added and the samples were vortexed for 60 s. Subsequently, the buffer was plated-out on different nutrient agar plates (BHI, Columbia Blood Agar, LB, Slanetz and Bartley) obtained from Oxoid (Basingstoke, UK). Arising colonies were streaked-out at least twice to obtain pure cultures, which were used for identification. In summary, pilot files from 13 root canal-treated teeth were investigated, with six showing no bacterial colonization. A thin layer of bacteria from fresh colonies was spotted on a stainless steel target using a toothpick and overlaid with 1 µl of HCCA matrix (10 mgl α-cyano-4-hydroxycinnamic acid ml−1 in 50% acetonitrile/2.5% trifluoro-acetic acid). After drying at ambient temperature identification was performed by MALDI-TOF MS using a Microflex LTTM and the BiotyperTM 3.1 Software (Bruker Daltonik GmbH, Bremen, Germany) on the basis of 240 single spectra. Susceptibility to antibiotics was tested by incubation of bacteria and together with antibiotic disks for 48 h on Mueller–Hinton agar and results were interpreted using the breakpoints for zone diameters of the European Committee on Antimicrobial Susceptibility Testing (EUCAST, http://www.eucast.org). When no breakpoints were available, criteria for related bacteria have been used. Biofilm formation on artificial surfaces was tested in glass tubes filled with 4 ml BHI and LB medium, respectively. Tubes were incubated on a rotary shaker at 37 °C and biofilm formation was analysed after 1, 3 and 5 days. For this purpose, medium (control) and R. mucosa cultures were removed, the tubes were washed twice with water and biofilm staining and quantitative analysis was carried out as described . For colonization of gutta-percha points (Maxima gutta-percha points #30, Henry Schein Dental, Langen, Germany) these were incubated with bacteria in glass tubes (control: incubation in not inoculated medium). Additionally, biofilm formation on polystyrene was tested in microtiter plates . For fluorescence microscopy, extracted bisected and sterilized teeth were incubated in R. mucosa-inoculated BHI medium flasks for 3–4 days. For staining, teeth sections were removed from the flasks, rinsed with distilled water and incubated for 15 min in SYTO9 solution (ThermoFisher Scientific, Dreieich, Germany). Fluorescence microscopic inspection at 20× magnification was carried out using a Zeiss Axio Imager A1 (Carl Zeiss Microscopy GmbH, Oberkochen, Germany) with fixed wavelength and filters for GFP fluorescence equipped with a digital camera (Zeiss Axio Cam MRc5) and analysing software (Zeiss ZEN 2011, version 1.0). In frame of this study, thirteen teeth were tested for microbial colonization of the root canal. In seven cases, microorganisms could be isolated (see Table 1), while six samples were sterile. The majority of isolates were identified as infectors of the human root canal before, e.g. bacteria such as Actinomyces oris, E. faecalis, Lactobacillus species, Streptococcus oralis and Streptococcus sanguinis or yeasts such as Candida albicans and Candida dubliniensis,. Among microorganisms isolated from a file used to prepare the root canals of an inflamed tooth, pinkish white pigmented colonies with a mucoid, almost runny appearance were frequently observed. Pure cultures were obtained by careful re-streaking (Fig. 1) and using MALDI-ToF mass spectrometry the corresponding bacteria were identified as R. mucosa with a score of 2.4. The bacteria grew on all tested media (Columbia Blood Agar, LB, Slanetz and Bartley), with a preference on rich BHI medium. Slime formation was observed on all solid media tested as well as in liquid culture from which the extracellular polymer could be easily harvested by filtration (data not shown). When the isolated strain was tested in respect to antibiotics resistance using the Kirby-Bauer disk diffusion test, R. mucosa showed resistance to the β-lactam antibiotics ampicillin, ampicillin/sulbactam, piperacillin and piperacillin/tazobactam as well to the cephalosporines cefazolin, cefuroxime and ceftazidime. Surprisingly and in contrast to the other cephalosporines and penicillines tested, R. mucosa was susceptible to ceftriaxone. Sensitivity to the carbapenemes imipenem and meropenem, to the aminoglycosides gentamicin, tobramicin and amikacin and to the fluorochinolone ciprofloxacin was observed, while the strain was resistant to fosfomycin. Sensitivity was also found to the sulfonamides trimethoprim/sulfamethoxazole, the tetracycline antibiotics tetracycline and tigecycline and to polymyxin B (Table 2). The extremely slimy, almost runny appearance of R. mucosa colonies (Fig. 1) indicated a strong formation of extracellular polymers, which may protect the bacteria against dehydration and detrimental environmental conditions. Furthermore, the polymer might support biofilm formation. Different surfaces were tested, starting with established model material such as glass and polystyrene  followed by gutta-percha points used as filling material in root canal treatment as well as teeth, and extracellular polymers and sessile bacteria were stained using crystal violet. Independent of the medium and surface material used, biofilm formation was detectable (Fig. 2). R. mucosa grew predominantly at the medium-air interphase (Fig. 2a), as it can be expected due to a higher energy yield when oxygen is used as final electron acceptor. A time course of biofilm formation on glass (test tube), gutta-percha and polystyrene (microtiter plate) surfaces and in LB and BHI medium revealed that biofilm formation is coupled to growth of the culture and increases with time. While glass surfaces were colonized best and stable, solid biofilms were formed (Fig. 2a, c), gutta-percha points and polystyrene surfaces did support only weak attachment of the bacteria. On the surface of gutta-percha points, which comprise a hydrophobic surface, no confluent but local, spotty biofilms were observed (Fig. 2b), which showed high variability and low stability. After 6 days of incubation, previously formed biofilms fell off the gutta-percha points (Fig. 2d). Also biofilms on polystyrene were characterised by only loosely attached material resulting in high standard deviations in quantitative biofilm analyses (Fig. 2e). Biofilm formation on dentin, the natural surface of the root canal, was tested using extracted teeth. Bacteria were stained with SYTO9, a fluorescent dye penetrating the cell membrane, and visualized by fluorescence microscopy. As shown in Fig. 3, bacteria were colonizing the wall of the root canal in a compact layer of cells and extracellular material. Roseomonas mucosa seems to be the most prevalent Roseomonas species in clinical samples and in contrast to other Roseomonas species, a considerable number infections of immunocompetent patients has been reported [20, 23]. While previously infections were attributed to environmental sources, a recent study suggest skin microbiota being the main reservoir of this emerging pathogen . The isolation of R. mucosa from an infected root canal in this study hint to the possibility that besides catheters also infected teeth might be an entrance pathway for blood stream infections by this pathogen. As indicated by its name, R. mucosa is characterised by a strong slime formation, which might be beneficial for biofilm formation. In fact, attachment of the bacteria to different abiotic and biotic surfaces including dentin was found and biofilm material could also be harvested from liquid cultures (data not shown). Hydrophobic surfaces like gutta-percha points seem to obstruct sessile growth of R. mucosa. 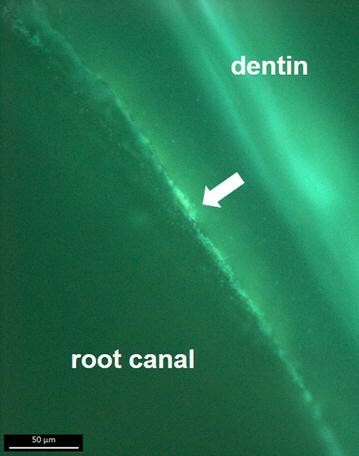 Biofilms on the root canal wall as found in this study are involved in primary apical periodontitis and may support colonisation of dentinal tubules, which might subsequently contributes to resistance to treatment with disinfectants [2, 5] and antibiotics. R. mucosa was susceptible to ceftriaxone, whereas all other cephalosporines and penicillines turned out completely resistant. These results are in accordance with observations made in a recent study by Romano-Bertrand and co-workers (. These authors suggested the production of β-lactamase as reason for resistance. Consequently, the observed resistance to these antibiotics might also protect other pathogenic bacteria from antibiotic treatment when growing together with R. mucosa in multispecies biofilms in the host. This first report of the isolation of R. mucosa from an infected root canal and the characterisation of biofilm formation of the corresponding strain might further contribute to the knowledge on this emerging pathogen and its reservoirs. However, further studies besides this single case report and initial experiments are necessary to establish that R. mucosa is a significant member of the microbiota of infected root canals and to fully understand its role in oral health. ND carried out growth experiments and characterized biofilm formation, SK isolated the strain from files of a root canal treatment, WG identified the isolate and carried out antibiotic susceptibility testing, TG-K was responsible for fluorescence microscopy, MK and AB designed the study and wrote the manuscript. All authors read and approved the final manuscript. The support of A.B. by the Dr. Hertha und Helmut Schmauser-Stiftung is gratefully acknowledged. Strain and data will be provided by the corresponding author on reasonable request. Isolation of microorganisms from C-pilot files was carried out following informed patient consent and ethics commission approval (Ethics committee Approval 159_16B, Medical Faculty, University of Erlangen-Nuremberg). All participants gave their informed consent prior to inclusion in the study.